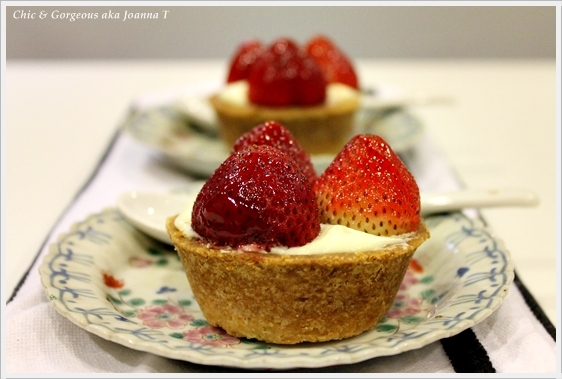 This is my very first time having my hands on making Strawberry Tarts. 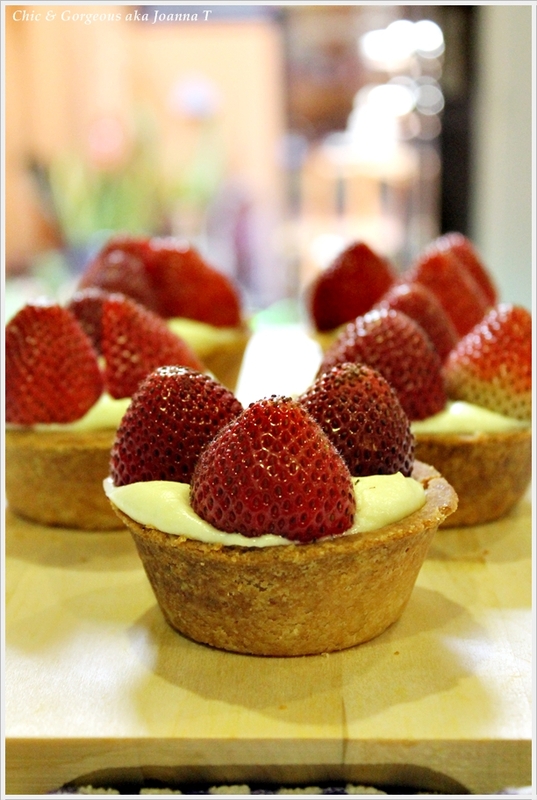 These little decadent tarts are one of my absolute favourite treats, apart from lemon meringue tart. 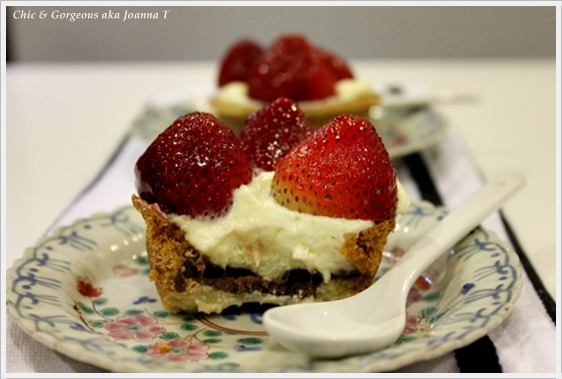 Whenever I travel, I will constantly hunt down a local bakery or dessert shop to sample their tarts. And so far, they have done justice. Hopefully mine taste like summer too.. with loads of heart and love put into it ;). 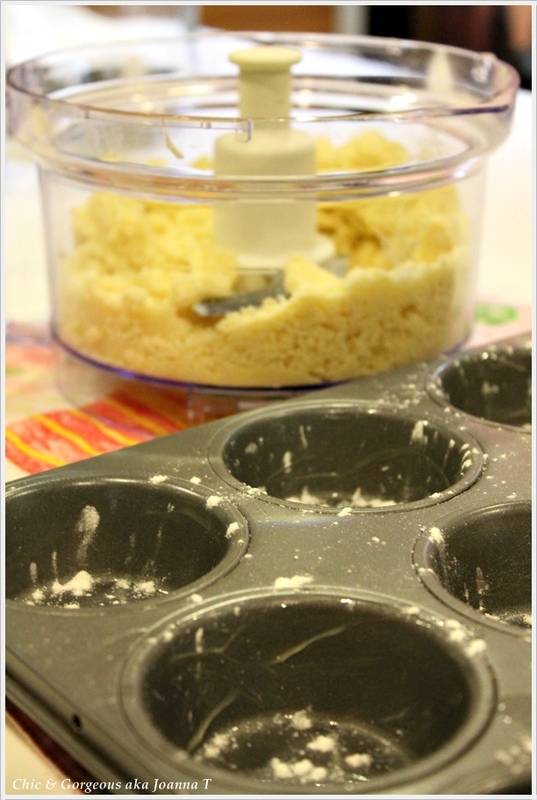 Note: In my case, I couldn't locate my tart pan so I've decided to make smaller individual tarts using my muffin pan. The recipe below yields approximately 6-8 tarts, depending on the thickness of the shell. 1. Preheat oven to 350 degrees. In a food processor, blend flour, butter, 1/3 cup sugar and salt until moist crumbs form (this may take up to approx1-2 minutes). 2. Make sure to lightly grease pan with butter and sprinkle flour over the pan. 3. Transfer dough to a 9-inch round tart pan with a removable bottom or muffin pan. 4. With floured fingers, press dough evenly into pan and up sides. Dip a dry measuring cup in flour, and use it to press dough firmly into bottom and against sides of pan. Freeze crust until firm for about 10-15 minutes. 5. Using a form, prick crust all over. Bake until golden, 25-30 minutes, pressing down gently once or twice with a spoon during baking if crust puffs up. Let cool completely in pan before transferring on to wire rack, cake stand or platter. 1. With a whisk, whipped whipping cream until soft peak/ stiff consistency. Becareful to not over whip. Transfer to another bowl. 2. Using the same mixing bowl and now with a paddle attachment, mix cream cheese and icing sugar until well combined. Then add in lemon juice a teaspoon at a time and continue to mix and then fold in vanilla extract. 3. With a spatula, fold in half of the whipped cream to cream cheese mix until well combine and then fold in the rest of whipped cream. Gently fold the whipped cream making sure to not let it turn into liquid form. 1. You can choose to glaze the bottom of tart with melted dark/ milk chocolate. Melt chocolate chips with 2-3 teaspoons of milk in a microwave for about 35 seconds making sure to stir and not burn the chocolate. 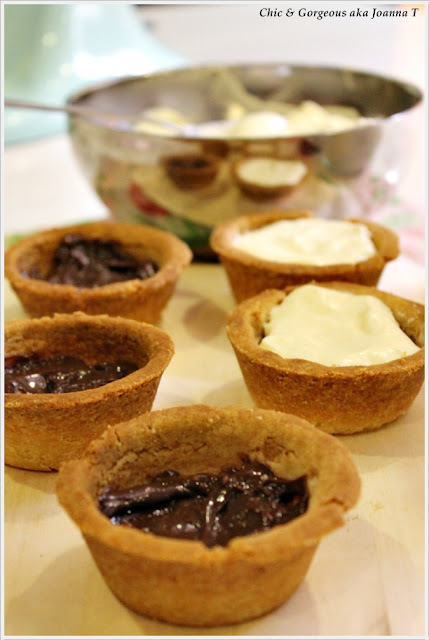 I glazed my tart with melted chocolate to prevent the filling to sip through the tart, making the shell soggy. 2. If you do glaze the bottom of tart, pop the tart shells back in the refridgerator for about 10-15 minutes or until glaze is set. 3. 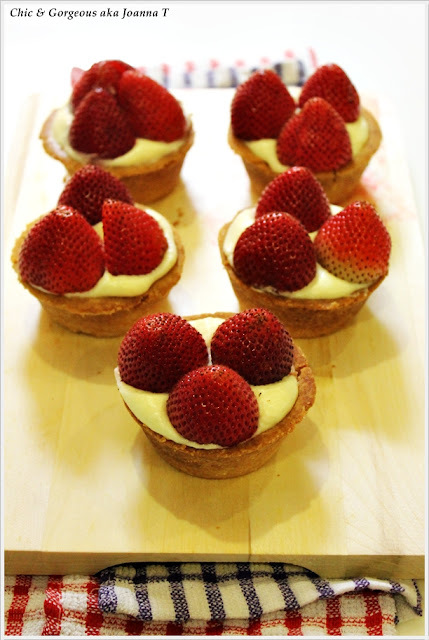 Spoon the filling into the tart shell, and top it with 3 whole and hulled strawberries to each tart. 4. In a small saucepan, heat jelly on medium low until liquefied or heat it in a microwave for 1 minute. Gently brush strawberries with jelly, let set at least 20 minutes. Thaw before serving, if tarts were chilled. I don't think there's a LadyBug cake out there. Or is there? Have you come across any? I must say, this cake is a random cake recipe whereby I mesh a couple of flavours together; which in my opinion works out quite well. 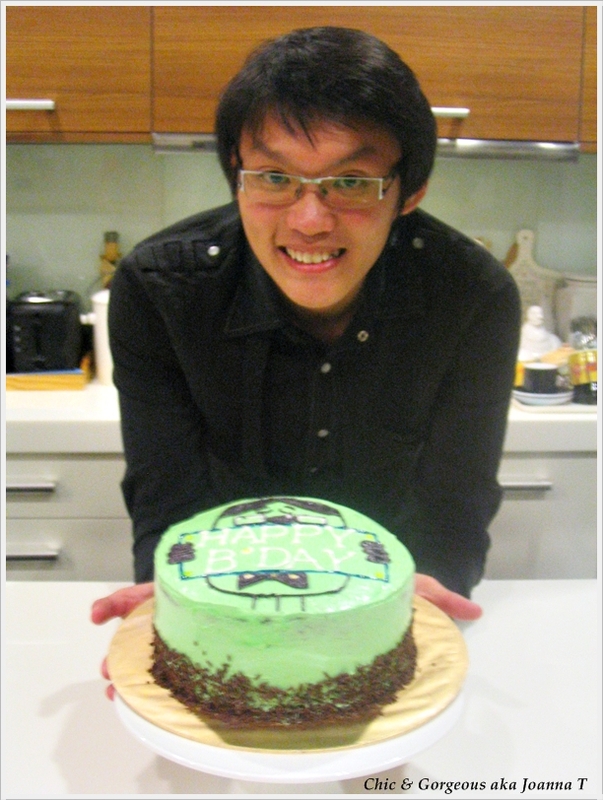 There were a couple of cake recipe I learnt by browsing through recipe books or other foodie blogs. 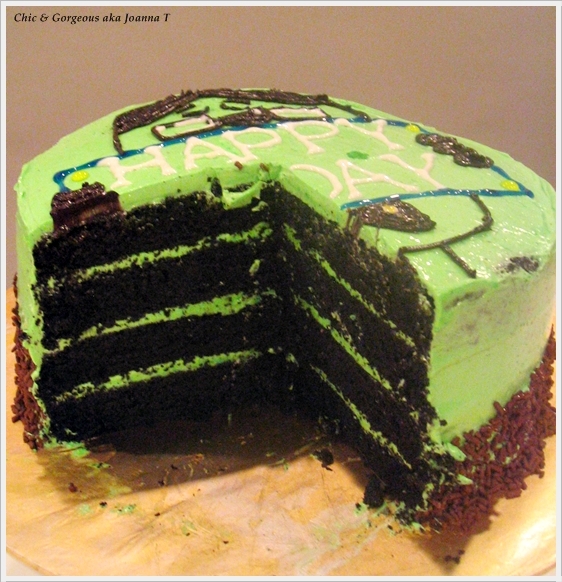 So I thought why not I challenge myself to bake a cake with my own mesh up of recipe, lol.. 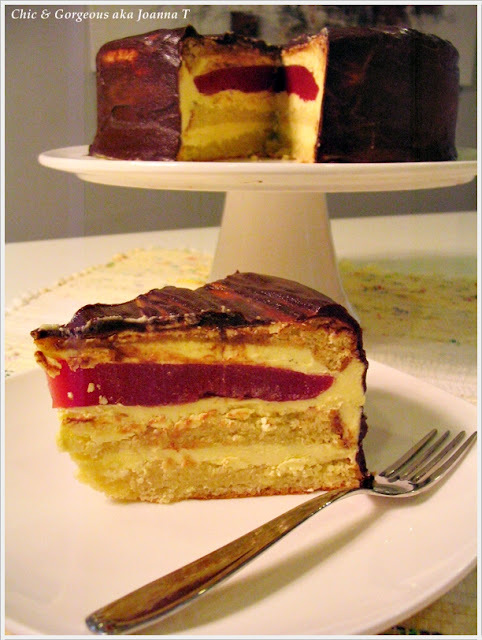 In a nutshell, this cake resembles a slight base of an Opera Cake. The cake is an almond sponge cake (joconde) but instead of coffee cream, it has been replaced with vanilla bean cream and in between is sandwich with a decadent raspberry-strawberry jelly between layers. 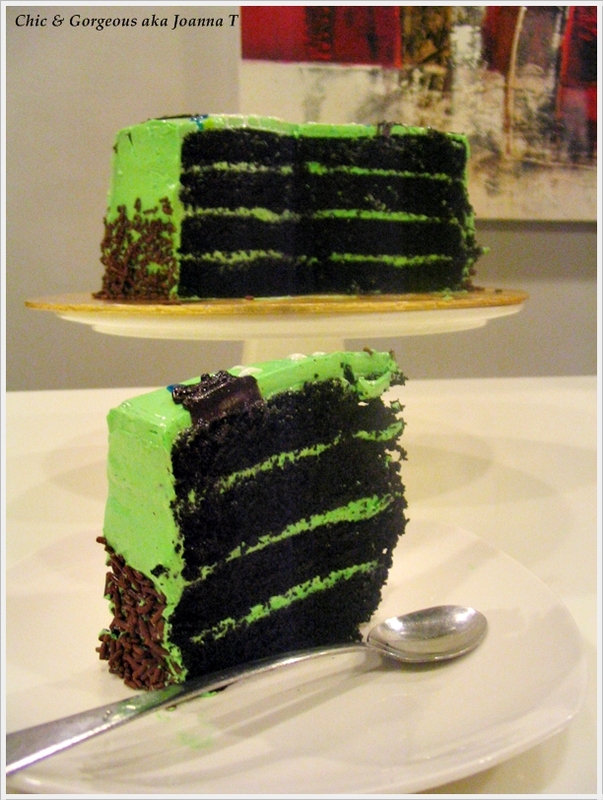 This adds a pop of colour to the cake. 1. Preheat oven to 220 Celsius. 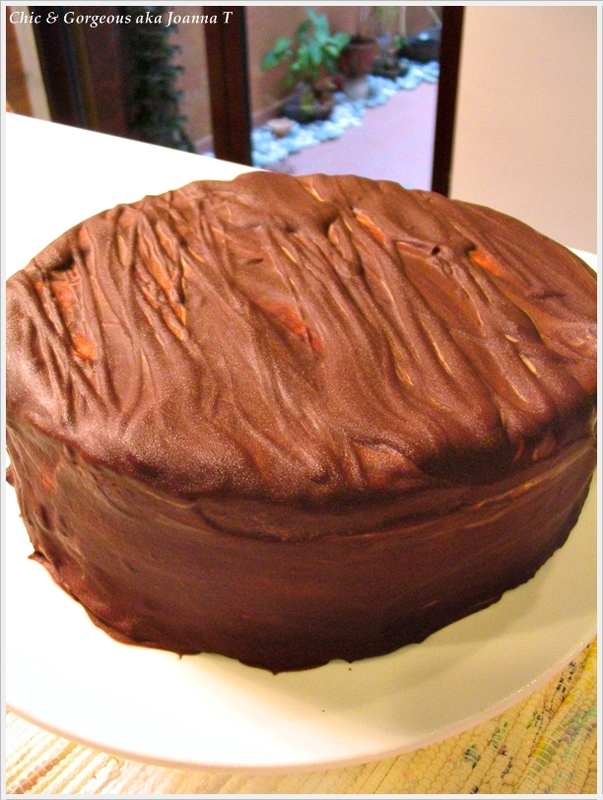 Line an 8 inches round baking dish with parchment paper and coat the sides with Wilton cake release or butter. 2. Sift together ground almond, icing sugar and flour. 3. Whisk the egg whites in the stand mixer until it sets in foamy soft peaks. 4. Add caster sugar a spoon at a time and continue to whisk for a few more seconds. 5. Next, add whole eggs and mix them well. 6. Fold in the almond and flour mixture into the egg mixture. To that add in the melted butter and mix until mixture is smooth. Pour onto the baking dish and bake for about 8-10 minutes or until a tooth pick inserted comes out clean. Transfer cake to a wire rack and let it cool completely before refrigerating the cake. 1. Line a shallow round dish, about (7-8 inches) with parchment paper. 2.Sprinkle the gelatin over the cold water and reserve. 3. In a large saucepan set over medium low heat, bring the raspberries, strawberries and sugar to a simmer and cook until the berries are completely thawed and reduced to a puree (smash them down with a spoon if necessary) and the sugar is dissolved. 4.Remove from the heat and add the gelatin, stirring until it completely dissolved in the raspberries. Pour over the prepared shallow dish. Let cool to room temperature and then freeze until firm. 1. Combine milk and vanilla pod in a small saucepan and bring to a boil. 2. In a mixing bowl, whisk egg yolks and sugar until pale. 3. Strain the vanilla milk mixture and gently pour into the yolk mixture while whisking. Make sure to not pour directly over the whisk, and pour down the sides of mixing bowl, to avoid having scramble eggs. Mix well and pour the mixture back into a saucepan. 4. Cook under medium heat, stirring constantly until it thickens. A tip, you could actually feel the spatula getting slightly heavier. 5. Strain immediately into a flat tray and allow to cool to room temperature. 6. 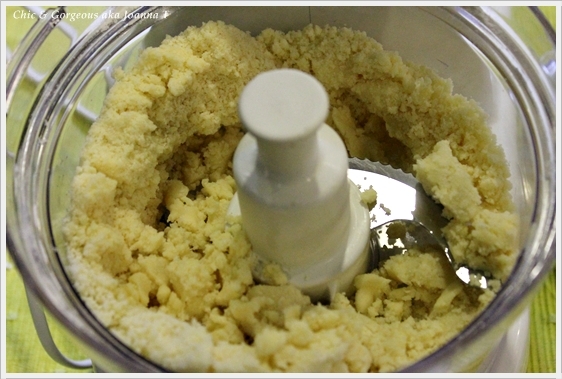 With a paddle attachment, pour the mixture into a stand mixer and at medium speed, beat in the butter, 1 cube at a time. At first the mixture will still be diluted, however, don't worry, continue to add in the butter and you will notice the mixture will slowly turn into cream consistency. Once thicken, whisk it as high speed for a couple of seconds and now your cream is ready. It should be smooth, thick and light with no lumps. 1. Soak gelatin in room temperature water/ cold water is fine. 2. Boil the cream, sugar and water in a small saucepan. Add in the cocoa powder. Whisk for 2 mins on the heat and add the soaked gelatin; stir until dissolve. Remove from heat, cooling it at room temperature, and then transfer to the refrigerator. 1. 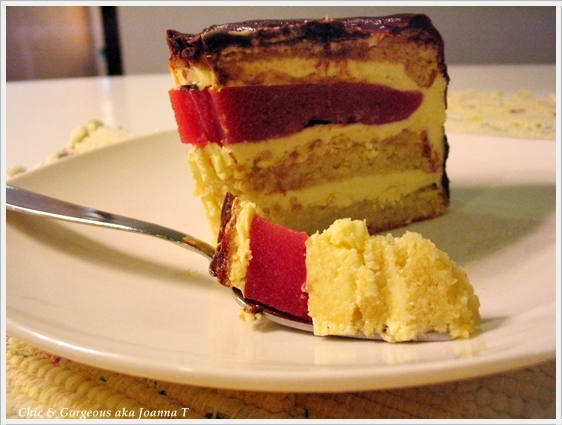 Remove almond sponge from the refrigerator. 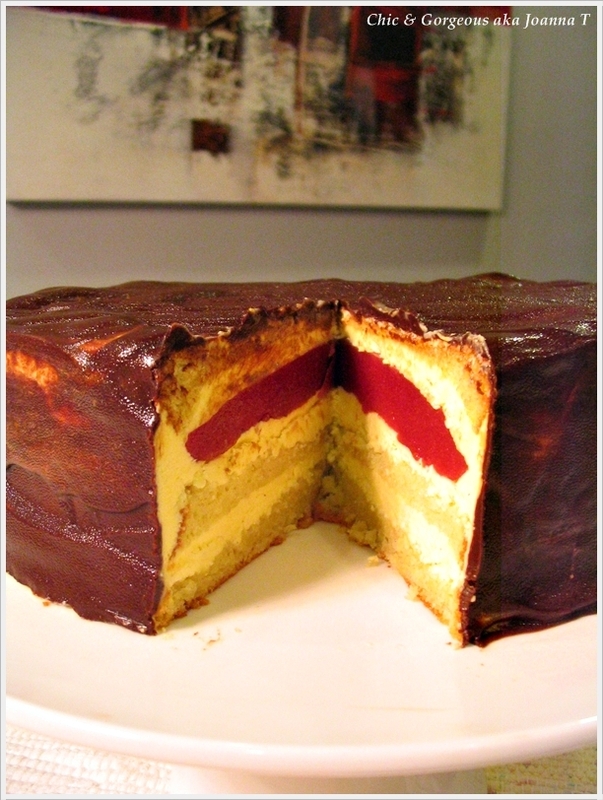 Peel off parchment paper and with a serrated knife, slice the cake carefully and thinly into 3 layers. 2. Spread the bottom sponge layer with vanilla bean cream and then top with second layer of sponge, and spread another layer of vanilla bean cream. 3. Meanwhile, remove the raspberry-strawberry jelly and place it over the vanilla bean cream which was spread on second layer of sponge. 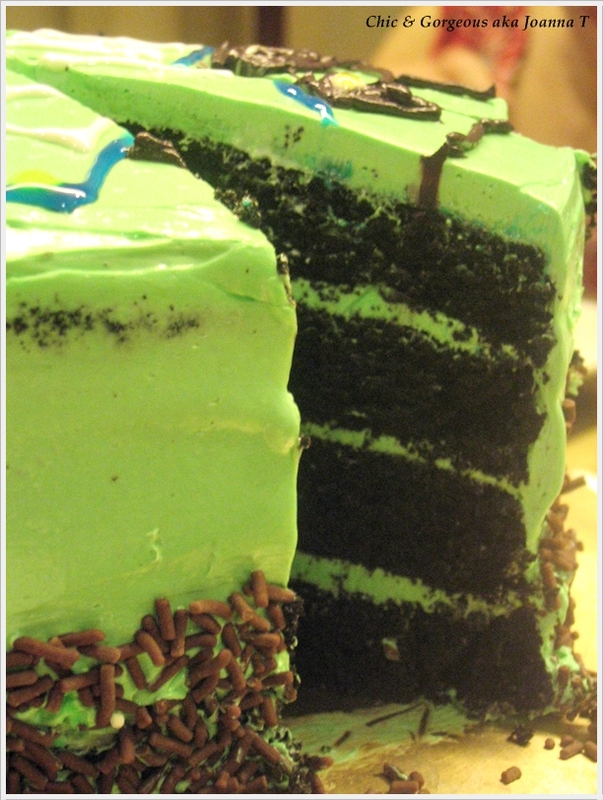 Top with the third sponge layer and spread cover the whole cake with vanilla bean cream. 4. Melt the chocolate glaze in microwave oven on defrost setting for just a couple of minutes (approx 2-3mins, be careful not to let chocolate burn) and pour over the cake. Chill in the refrigerator to let glaze set and thaw before serving. I just saw Elizabeth's comment asking "where have I been?" A shout out to Elizabeth... I'm BACK!!!! Well, I had a writers block. Not an excuse, but I was filled with so much work that my weekends became my lazy weekends. Have you heard of Mr Men and Little Miss? I've always love these characters. They are just so cute and funny. 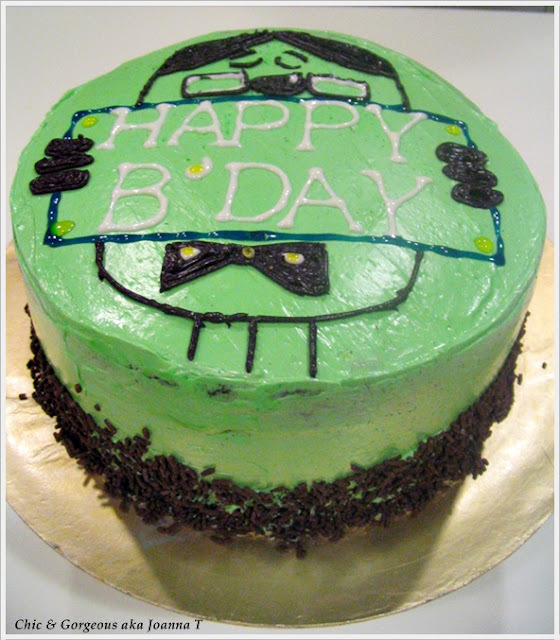 My brother's birthday was back in March, and I thought to celebrate his day, I will bake him a cake. He loves to eat what I whip up or bake and has always been very supportive by giving me positive comments. Mr Persnickety. You'll see why later that this cake fits him. This time round, instead of my Hershey's chocolate cake recipe, I decided to try out Martha Stewart's recipe which was published in her Living magazine, January 2009 her no# 182 edition. 1. Preheat over to 350 deg or approx 180 Celsius. Butter or use Wilton's cake release to coat an 8-by-12-inch cake pan. Line bottom with parchment. 2. Lightly whisk using a hand whisk to combine cocoa powder, flour, sugar, baking soda, baking powder, and salt in a large bowl. Then transfer to your stand mixer's mixing bowl. 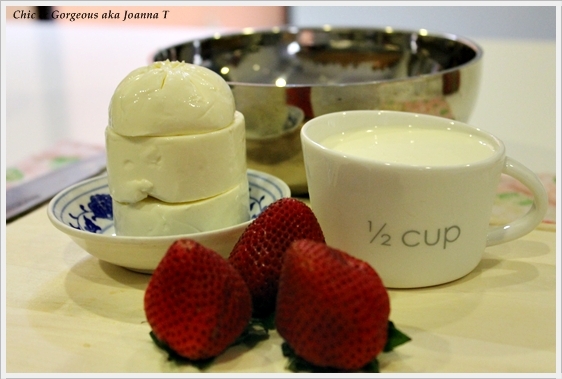 With a paddle attachment, mix in eggs, warm water, milk, sour cream or buttermilk, butter and vanilla extract. Keep mixing with medium speed until batter is smooth with no lumps. 3. Pour batter into prepared pan. Bake for approx. 35-40 minutes or a tester inserted into the center comes out clean. Let cake cool for a bit before transferring onto a wire rack to complete cooling. Note: Cake will keep up to a week, if unfrosted. Note: To decorate, you can always opt for chocolate sprinkles, white sprinkles, Andes Creme de Menthe candies, After8 thin chocolates etc. 1. Mix whites and sugar in a mixer bowl set over a pan of simmering water. Heat, whisking constantly until sugar dissolves for approx. 2-3 mins and mixture is warm. 2. Remove from heat. With a whisk attachment, whisk on high speed until stiff peaks form, for about 5 minutes. Add butter, several cubes at a time, whisking after each addition. Add creme de menthe, vanilla and food colouring, then beat for another 2 minutes, scrapping down sides of bowl when needed. I'm still thinking of ways to improve the look of my blog. Now I really admire the job of a web designer. As much I've studied web designing during my uni days, I feel that I might have lost some of my spark in creativity. That also explains why I've not been posting much. Perhaps like what most writers call it "a writer's block?" So my dear friends who are reading my post, do provide me with feedbacks as I know I'm itching to improve my post and the look of it. Therefore, I appreciate any positive and constructive feedbacks. Currently I've made minor changes if you notice. If you like it, let me know too. Not sure if the whole Black and White works well for treats.. Hmmmmpppphhhh?? What say you?